Canada’s majestic boreal forest is home to hundreds of Indigenous communities, helps regulate the global climate by holding more than 306 billion tons of carbon in its soils, plants, and wetlands, and provides habitat to the iconic boreal caribou and thousands of other species. But right now, the boreal forest, its boreal caribou, and the culture and traditions of hundreds of Indigenous communities are severely threatened by logging and other destructive industrial development. Canadian Prime Minister Justin Trudeau must step up as an international leader on climate and conservation and commit to defending one of the world’s last great forests. Urge Prime Minister Trudeau to take immediate action to stop destructive logging and other harmful industrial development in Canada’s boreal forest, and save this spectacular wild place and critical species like the boreal caribou. Canada’s majestic boreal forest is home to hundreds of Indigenous communities, helps regulate the global climate, and provides habitat to the iconic boreal caribou and thousands of other species. Urge Canadian Prime Minister Trudeau to speak up against destructive logging and other industrial activities and protect Canada’s boreal forest and boreal caribou. Dear Prime Minister Justin Trudeau: Canada’s boreal forest is one of the world’s most important climate regulators and carbon storehouses. It is also home to hundreds of Indigenous communities and provides habitat to the iconic boreal caribou and thousands of other species. 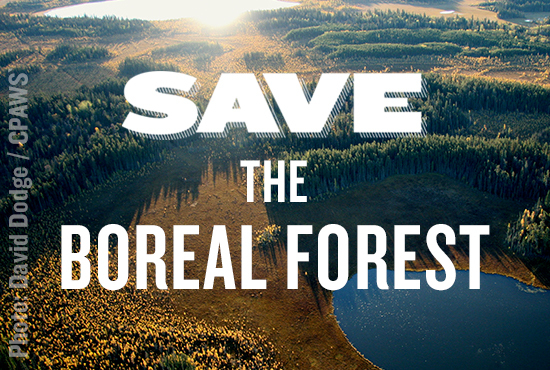 But right now, the boreal forest is being destroyed by logging and other industrial activity. Canada’s provinces have continually failed to protect the boreal forest and its boreal caribou. The international community is counting on you to help change course and save this spectacular wild place, its communities, and the wildlife that have thrived there for centuries. Please take immediate action to develop a comprehensive plan to save the climate-saving boreal forest and its boreal caribou -- before we lose them forever.